Come enjoy a gym full of incredibly fun inflatables and help raise money for the LincolnWay Special Recreation Association. Come on out and play at Lincolnway Special Recreation Association. 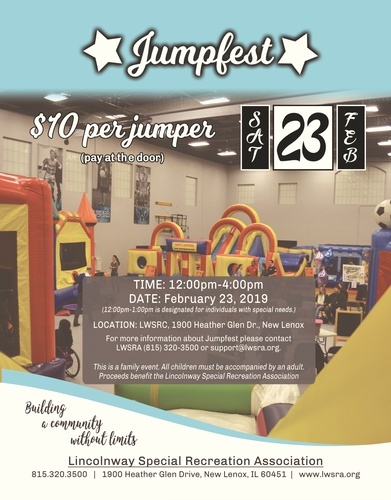 LWSRA is having a JUMPFEST fundraiser on Saturday, February 23 from 12 – 4 pm (12pm – 1pm is reserved for individuals with special needs). Enjoy a gym full of incredibly fun inflatables while helping to raise money for LWSRA. Jumpfest will be held at the LWSRA Rec Center located at 1900 Heather Glen Drive in New Lenox. The cost is $10 per child - payable at the door. This is a family event open to the community and all children must be accompanied by an adult. For more information, visit www.LWSRA.org/jumpfest.